Kota Kinabalu: Sabah has made it into the World Guinness Book of Records, thanks to the world record feat of Astro Kasih, the Corporate Social Responsibility arm of Astro. 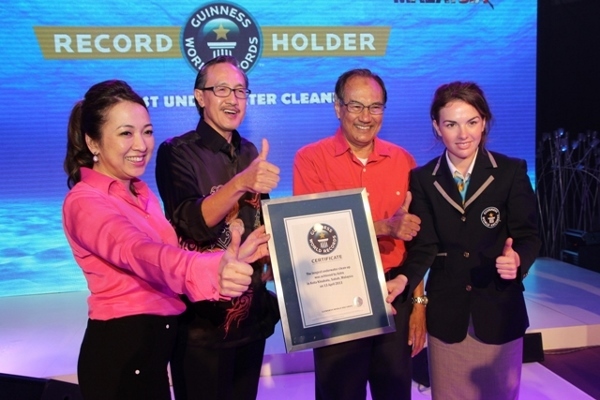 The feat was achieved by more than 139 local and international volunteers who completed 168 hours of consecutive diving in the "Longest Underwater Clean-up" off Tunku Abdul Rahman Park from April 16 to 13. In revealing the world record Saturday, Guinness Adjudicator, Kirsty Bennet, said the divers collected a total of 3,008.22kg of rubbish, with the initial weigh-in of 3,171.56kg, from the 224 diving sites involved in the feat. "I had to go through the video footages and interview witnesses as I discovered there were incidences of some of the divers losing their nets during their dives," she pointed out, after announcing the successful feat. The divers had collected 1,526.12kg of plastic materials, 140.44kg of glass and ceramic, 5.35kg of paper and cardboard, 318.36kg of metal, 335.84 of rubber and clothes and 682.11kg of wood products. Astro's Community Affairs Vice President, David Yap, said most of the rubbish were collected near human settlements. Bennet hoped Astro would be able to keep the feat as it is the first of its kind to be inserted into the Guinness Book of Records. Astro Chief Executive Officer, Datuk Rohana Rozhan, said more than 800 divers applied to take part in the programme and it had been a tough exercise to select the divers. "This achievement is amazing, thanks to all the divers who had given us their support in making it into the World Guinness Book of Records," she said. The Longest Underwater Cleanup involved divers from Malaysia, France, USA, Lithuania, Australia, New Zealand, Switzerland and Hong Kong.